Last spring, an article in Wired piqued my interest. 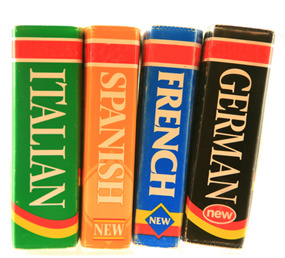 “Thinking in a Foreign Language Makes Decisions More Rational,” it announced. Apparently, when we make choices in a foreign language, our biases and impulses lose a little of their power. Sacre Bleu, I thought: a little validation for my struggle with occasional French lessons. I thought of a few friends and acquaintances in foreign-language discussion groups. They try, like me, to maintain their own little communities of foreign-thinking brain cells. And I thought of old friends—Japanese and Bavarian–who still enjoy practicing their English with me by email, years after their stays in the U.S. According to Wired, when people think in a foreign language, they slow down and make choices more deliberatively. But I like to think there’s more to making better choices in another language. When I try another language, I see life framed differently. I see the idiosyncratic assumptions of my own culture and my own thinking revealed–as well as those of the other culture. I feel freed, as if from a little vacation abroad. The casual French, J’ai ete tres contente de te voir, sounds more relaxing than the Anglo-American, “I was happy to see you.” “Happiness,” or la bonheur, as Freud pointed out, is a fleeting emotion. “Contentment” with its milder, more habitual character, carries one to the sun-soaked south of France with its chronically good-humored denizens. Not only do I like to imagine my own biases diminished by another perspective, I like to think that Conventional Wisdom supports this idea of a transformative effect to Foreign Language learning. See, for example, the charming Danish comedy, Italian for Beginners (2000). Meanwhile, if a chat with a friend from Southern France is as close as I can get to that sunny, and seemingly more carefree region for the moment, I’ll take it. This entry was posted in Uncategorized and tagged Decision-making, Foreign language, Travel. Bookmark the permalink.